Just when you think you have the recipes and techniques all wrapped up, there comes along another tip or idea. And sometimes it will not only improve the recipe but simplifies it. My favourite cooking companion, Auntie Lucy and myself have been fastidious in trying to improve on the rice of our Nasi Lemak recipe. Our favourite approach is to cook it in the rice cooker before steaming it in a steamer. It is definitely better than just cooking it in the rice cooker as the rice turns out fluffy. However, when you are cooking a big pot of rice in the rice cooker, inevitably some of the rice will stick together as the cooker cooks unevenly. Through a tip from a friend, we began to experiment with frying the raw rice first. I could see the difference it made: each grain of rice is separated. And texture wise, it has more bite in it. I think heating up the rice makes it like the rice we use to get in the past - old rice. Old rice is dryer. I have not figured out the science of it but the rice has less tendency to stick together when cooked. The rice on the right has been fried. 1. Fry the raw Thai jasmine rice for about 15 minutes. Fry it dry in a wok. You do not need oil. It will turn opaque and look like glutinous rice as it heats up. 2. Next, cook the rice in some coconut milk in the electric rice cooker. If you use fresh coconut, reserve the cream (first squeeze) for the later stage and use the 2nd or 3rd squeeze where you added water. Keep to the rice-water ration of 1:1. If you are using a packet coconut cream like Kara, just add 2 tablespoons of the cream to the water. Add some salt too. Cook the rice all the way through i.e. when the button clicks to "warm", leave it there for another 10 minutes. 3. 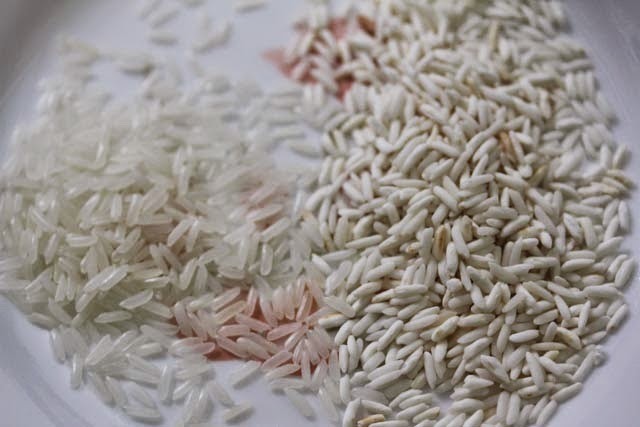 You will see immediately that the rice grains are separated. Next, you pour in the thick coconut cream (or the rest of the packet cream). Move the rice to the steamer and add the pandanus leaves. Steam for 15 minutes. 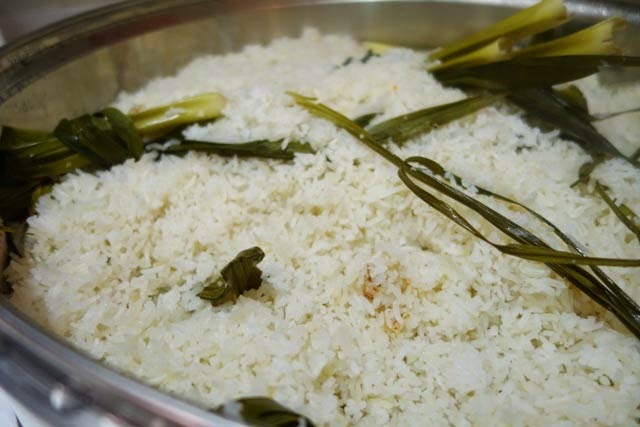 The pandan leaves scent the rice and it is best to add it at the last minute. If you do it earlier, it is wasted as with the high heat, the flavours will dissipate. That's it. You can simplify this further and omit the steaming process. Just add the cream and pandan leaves in the rice cooker and mix. Cook it for another 10 minutes. It will not be as fluffy as if you followed through with steaming, but it will still be good. Try it out and let me know your result. 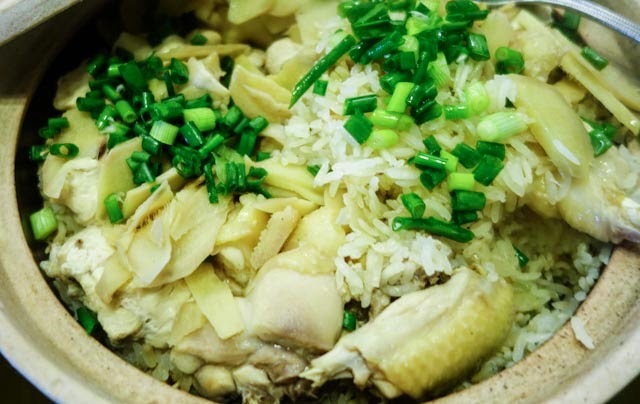 The same principle (frying the raw rice first) will also work for Claypot Chicken Rice, Hainanese Chicken Rice etc. 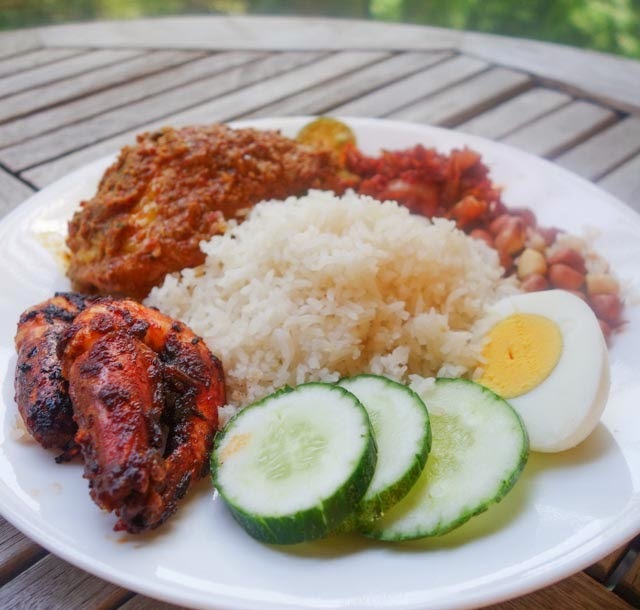 Eh, heard that the famous nasi lemak stall at Adam Rd food centre uses basmati rice. Maybe you can try using it in your nasi lemak, chicken rice etc. At which stage do we wash the rice? Thanks for the tips, didn't know that need to fry the raw rice first.